l saw the new Pitch Perfect movie last night. I’ve seen the first Pitch Perfect movie many times. I loved it, it was not without problematic things, but I thought that it also did a lot of subverting stereotypes and bigotry as well. Near and dear to me was the character Fat Amy who was written to be stereotypical in some ways (the un-athletic funny fat friend etc.) but also had high self-esteem, tons of love interests, and a starring role – a main character in a big movie who is unapologetically fat and was shown as a sexual being with a story line that didn’t involve dieting. This is a big deal, so I was super excited to see the new one. I’m also looking at this movie through different eyes. When I watched the first movie a screeplay had been written about my life and, if I’m honest, I didn’t expect much to come from it. But now the movie is in development and I spend a lot of time thinking, and talking, about what it means to create a movie with a fat main character who loves herself, loves her body, and fights back against weight bias, and what it means to do it without the cover of fat jokes to “take the edge off” people’s discomfort at the idea of a fat woman who doesn’t hate herself. This makes me more excited than ever to be making the movie. Fat people deserve to see people who look like us represented positively in the media that we consume (and pay for) and this movie will be one opportunity for that and I can’t wait to make it! I’m so glad you wrote this! 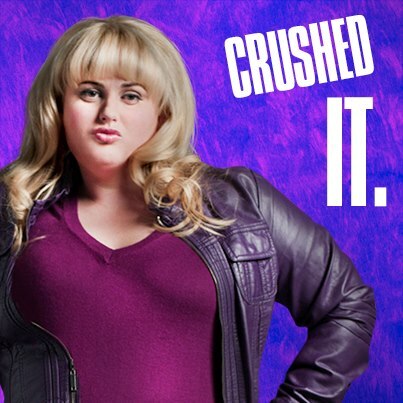 I love Rebel Wilson but have been avoiding the Pitch Perfect movies based solely on the character’s name. I am glad to hear that she is treated as a real person, not a caricature. Too bad they couldn’t maintain that level of writing for the second film. I don’t know anything about the movies, but I do know that you are a very beautiful woman! I so agree about Pitch Perfect 1 vs. 2. The first film was a lot more fulfilling. The second film was still enjoyable, and there were a lot of positives, but the jokes, particularly about fat bodies and race, felt cheap and more “joke-y” than in the first film. Why is it that only the fat girl needs an “qualifier” in front of her name? Only Amy is “Fat Amy” but none of the other girls ist “Thin $Name”. Hopefully this will change one day and a fat girl is just one of the girls without having her body size made into a plot “device”. The character herself introduces herself as “Fat Amy”. No one labels her that. Probably, someone labeled her that long, long ago, and instead of crying about it, she OWNED it. Like we Yankees did with the song “Yankee Doodle Dandy,” which had been meant as an insulting song for the Brits to sing at us, to get us all hot under the collar, but we turned it around and made it our theme song. Likewise, many people have decided to reclaim the word “fat,” and say it’s not a pejorative, but merely a descriptive, rather than use euphemisms, like “fluffy,” or “plump.” I get the feeling that’s what Amy was doing there. I hadn’t seen either Pitch Perfect film, so I’m glad to have some information about them. Sounds like I’ll be checking out number one, but might give number two a pass. As for the film about you… I’m going to want to see that ten million times. Me, too, on all three points. I now want to see the first one, and I want to see Ragen’s film, but I can skip Pitch Perfect 2. Likewise, I’m turned off by the show “Bones.” I cannot recall any positively portrayed fat character on that show, but the micro-aggressions against fat people are starting to add up. Years ago, there was a scene with a fat woman, who smelled (also, she was a vile, abusive mother), and Bones said it was because of the fungus growing in her fat-folds. Recently, she saw a bunch of re-modeling of broken bones in a child, and accused the parents of beating the kid, until she saw a picture of the child when she was young and chubby, and said, “Oh, my bad. She broke her bones simply by being a fat kid.” Ummmm, no. I have been a fat kid, and known many more fat kids, and NONE of us have ever broken a bone without some actual trauma, like falling out of a tree (yes, fat kids climb trees, too), or something like that. None of us broke our bones, just from being fat. Also, the kid in the picture “wasn’t even that fat.” She was Hollywood fat kid, not OMGBBQDEATHFAT!, which makes it even less likely that the story would hold water. The parents, offended at being accused of beating their child (who had lost ALL the weight, purely by self-control and a strong will), then accused Bones of being “pretty damn obese, yourself,” because she is six months pregnant, rather than only three. And there was the bit about Bones cheering the fact that she can still eat cookies, because she’s pregnant, not just getting fat. I have enjoyed this show for years, but after the last couple of shows, I’m ready to stop watching it, frankly. I stopped watching Bones years ago, in no small part because of that first scene you mention. I’m glad I’m not the only one who thought that was incredibly offensive. I still, on occasion, find myself rewriting that scene in my head. Ragen, these photos are lovely. I’m really looking forward to seeing your movie. Same for me. I haven’t watched it in years due to that episode. I have lived long enough with fatphobia, abuse, bigotry, and stereotypes heaped on me simply because of the size of my body and I have ZERO tolerance for it anymore in what I chose to watch for entertainment. I used to try and keep watching the shows that do that, and just try to ignore scenes like that and enjoy the rest of the show, but then I realized I was supporting that BS by watching it. As soon as a show “goes there”, that’s it for me these days – a clean break and I don’t go back. I don’t support that crap any more. It’s no longer enjoyable to watch once a show goes that route and makes fun of people who look like me. That moment you realize that your favorite character from a show or movie would hate you and anyone that looks like you – it’s happened entirely too often in my life. And I have zero patience for it anymore. The writers that do that to us, make us feel less than and hated simply because of our body size, they have no idea how much damage they do – or maybe they just don’t care. How come I didn’t originally see this post? I too stopped watching Bones, but it was due to the beyond slow “romance”. I was offended by that ep. with the “fungus in the folds”. I began to think that others thought that I stink, but no one said anything for fear of offending me. I thought that was a real thing since it’s a “science” show. I’ve taken to scrubbing harder in the bath to combat this, but I don’t think it’s real. P. S. I love Doug’s 6th photo, perfect! Wonderful photos – you are beautiful! I don’t watch a lot of movies, and frankly, the ads for Pitch Perfect 2 are a huge turn-off for me. The ads I’ve seen really promote the disgust with Amy. Just not sure I can sit through it. Something that’s been bugging me is that in the publicity photos for “Pitch Perfect 2” the Bellas are performing in tank tops, jeans, and vests, EXCEPT for Jesse J and Rebel Wilson, who are in t-shirts with sleeves. Because horror of horrors if plump upper arms get shown on screen! But worse is that in that scene Rebel Wilson is clearly wearing a vest that doesn’t fit! It won’t close! All of the other girls are wearing theirs buttoned, and hers won’t reach across her stomach. PLEASE. This is a Hollywood film with a costume budget. They couldn’t buy a vest in Rebel’s size? Or MAKE one to match? It just seems so cheap and disrespectful. I want to love Rebel Wilson, she’s beautiful and talented and it would be amazing to see her Really Truly represent fat people unapologetically and without the fat stereotypes. However after watching a few episodes of “Super Fun Night”, a show SHE created (and several episodes she even wrote), and filled with crappy fat-girl stereotypes – it left a lot to be desired as far as positive representation for fat girls. Scenes talking about her clogging toilets with her bowel movements, a scene with her sneaking cake into the bathroom to eat it alone in a bathroom stall, and other scenes that imply she’s obsessed with food, her extreme, over the top, and painful social awkwardness, etc. The show could have been an amazing step forward for fat representation, however it’s short 25 minute episodes somehow managed to squeeze in enough stereotypes that it fell short of positive representation by a mile. I’ve not seen anything else she’s been in, I will have to give Pitch Perfect a go to see if I like it. But honestly, I’m so burned out on being excited by FINALLY seeing a fat actress or two in the media and then have them only end up being portrayed as walking stereotypes. We have generation after generation of girls and women who don’t look anything like the positive representation of girls and women we see on tv – and we are in desperate need decent representation. If you like romance and/or portal fantasy, you might like Lauri J. Owens’ Embers books. Not only are the hero and heroine a pair of fat martial artists, there’s a mix of fat and thin characters everywhere along the morality spectrum, so nobody’s body type winds up as shorthand for good or evil. I think the black dress is my favorite just because of that nasty remark, but truly, you look gorgeous in all of them. I don’t see a lot of movies but I’m damn sure going to see yours! I am especially fond of the black/white/blue dress where you are bending backwards. They are all lovely, though. Good luck with the film, I look forward to seeing it. Love for fat women one an all! Great approach to real life movie clips! I love to read about how the movie of your life is coming along as well. That last picture looks so joyful! And I really do want to see the movie.